The ADDAPT SilStab range offers solvent free, Potassium Silicate solutions (with or without a hydrophobic component) for aqueous systems such as Plasters/Renders (Putz), Interior/Exterior primers, Textured Masonry Coatings and Interior Paints. 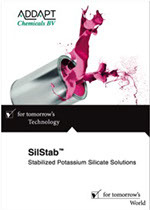 SilStab L 50 is a solvent free, Potassium Silicate solution for aqueous systems such as Plasters (Putz) and Coatings. SilStab L 100 is a solvent free, Potassium Silicate solution for aqueous systems such as Renders (Putz), Interior and Exterior primers and Textured Masonry Coatings. SilStab HL+ is a solvent free, Potassium Silicate solution optimized with a hydrophobic component for use in aqueous systems such as Renders (Putz), Textured Masonry Coatings and Interior Paints.